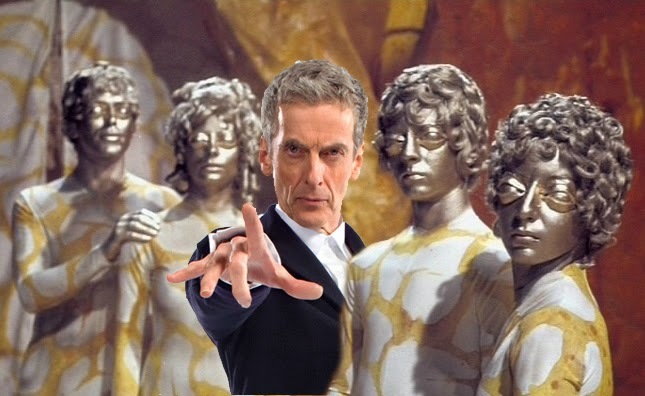 DOCTOR WHO - Peter Capaldi and the Claws of Axos | Warped Factor - Words in the Key of Geek. 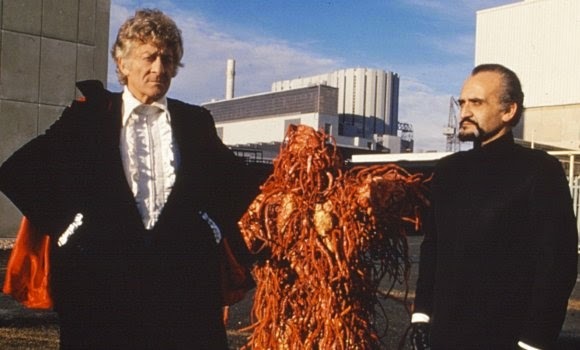 Christopher Morley ponders the possible return of one of Peter Capaldi's favourite classic Who enemies, the Axons. "Axons appeared as these kind of god-like creatures, but underneath they were festering bags of flesh." ...as the man himself puts it. A handy guide for any new-Whovian, from the horse's mouth so to speak. Would it/they need a redesign? Highly unlikely! Just take a look at this clip below and the idea of giving some long-forgotten costumes an airing & a bit of a modern twist won't seem quite so mad. Honest! Out of the blocks as Story 3 of Season 8 - the year that also introduced the Master into proceedings- The Claws of Axos saw Axos arriving on Earth & attempting to strike a bargain. In return for fuel, it promises technology beyond humanity's wildest dreams. Of course, with this being Who it isn't quite that simple. Is it ever? The promised miracle comes in the form of Axonite, a clever substance which can replicate almost anything, allowing unlimited food, water & power. What everyone forgets, including Brigadier Lethbridge-Stewart's guests Bill Filer ( an American partner agent of UNIT's) & a Conservative MP going by the brilliant name of Horatio Chinn, is that you should never trust an alien claiming its on Earth intending to do good. Come to think of it don't trust an MP claiming to do good either! Inevitably he's keen to do the deal for the benefit of the country. Axos isn't really as nice as it says it is, which justifies the Doctor's suspicions even while nearly everyone else is drooling at the prospect of a new ticket to prosperity. While visiting the Axon ship Filer's taken prisoner, & there's also another captive aboard. Go on, take a wild stab as to who! To earn his freedom he's forced to help with a scheme to distribute Axonite, the ' miracle' revealed as part of a plan to drain the planet of its energy & use that power to experiment with time travel- allowing Axos to scavenge anywhere in the universe that takes its fancy. As another part of its gambit a clone of Filer is sent off to see what it can do to help before being killed by the man its made from. The Master isn't really planning on helping Axos either- he just wants the Doctor's TARDIS as part of a bid to escape Earth. Unfortunately for him he can't get the blasted thing going! Before he can nip to the nearest Kwik-Fit, though, he's apprehended by UNIT. Ever the strategist, he offers to help them. All he wants in return is freedom. Does he care that the Doctor & Jo Grant will be killed alongside Axos if his plan succeeds? Not a bit of it. Which means they'll finally get off Earth, & can only be good. The Doctor is threatened with the prospect of joining them in the loop but manages to escape, as does the Master after being reunited with his own TARDIS of choice. At least his can get off Earth- we'll soon learn that the Time Lords took away most of the Doctor's knowledge of dematerialisation theory as part of his sentence imposed in The War Games, meaning he has to stick around a while longer ( he'll earn a reprieve for helping his two past incarnations thwart Omega, in The Three Doctors). His days of being a ' galactic yo-yo' will be numbered! Which brings us to the question of how exactly a return for Axos/the Axons could be handled if Capaldi is to get his wish. 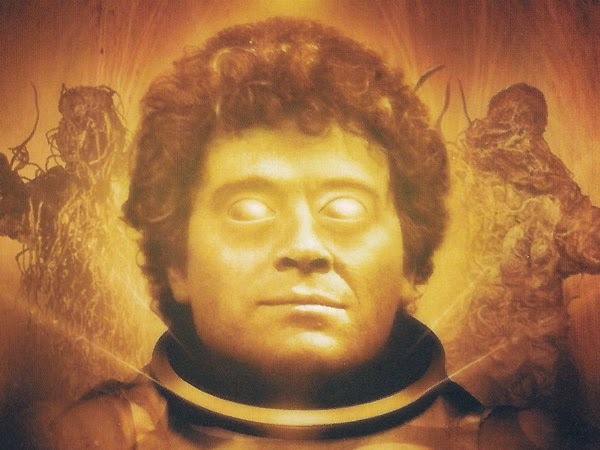 It/they've not appeared on screen since their tangle with the Third - though the Sixth Doctor faced them once more in the audio drama The Feast Of Axos. Could another attempt to drain Earth be on the cards? Now that the Doctor's had full knowledge of TARDIS operations for a while there's also scope for them to target any other corner of the galaxy, though whether he'll have filled a rather large gap in his memory having seemingly forgotten even how to pilot the Type 40 following his latest regeneration is a moot point. After all were the big return to happen it would most likely be in a future series if Steven Moffatt can be persuaded- he's not been very nice about Axos! . It would, should he change his mind, make a nice tribute to Jon Pertwee- after all if his newest successor at the helm of the good police box time-ship can basically pinch his wardrobe, why not allow for a returning foe from that era as a little fun for his leading man? "My father was very fond of Peter and Peter is an extremely lovely gentleman," So far, so good. "He was very kind to my family when my father passed away, he was big fan of my dad's actually. So personally the Pertwee household were absolutely delighted when he got the role of The Doctor." Nice work, Peter! But how does the Doctor's lad think his dad's old mate will get on? "I think he's going to bring some real gravitas and weight, which only comes with age. Taking nothing away from Matt (Smith), who I thought was great, I just think he's going to be stupendous. He's going to have a completely different look. He's such a phenomenal actor anyway I think he'll be absolutely brilliant. I'm delighted he's doing it." Not a bad endorsement there. Maybe not enough to persuade Moffatt to give over...but we ( & Peter Capaldi) can hope the Twelfth Doctor's given the chance to fulfill his portrayer's dream- after all isn't it all about that kind of magic?